All Waste, Inc. continues to emphasize safety as a priority above all else in our daily operations. Our safety record over-shadows that of our competition and to the credit of all our drivers, continues to improve. 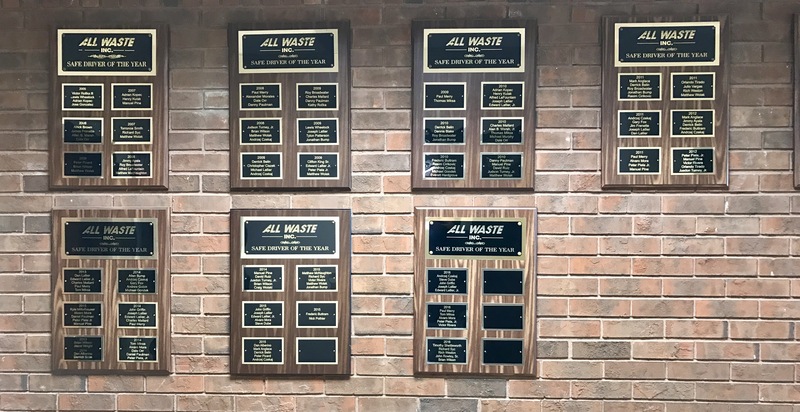 All Waste, Inc. has established a very strict and specific criteria to qualify our employees for the Safe Driver of the Year Award. Based on that criteria we are proud to announce that we have twenty individuals that had an exceptional safety record for 2016. We also have three individuals that have been nominated, and have advanced to the final round of considerations, for the National Waste and Recycling Association’s Safe Driver of the Year competition. Your diligence, awareness, and continued focus on safe equipment operation have earned you this award and title. Thank you for your continued dedication to ensuring your job and the jobs of those you encounter are done safely each and every day.